UniNet’s new iColor 600 color sheet label and apparel printer is a wide format (tabloid size) LED laser sheet printer that includes white toner. With its high speed, high resolution, full color capabilities, the iColor 600 is an innovative sheet label and apparel transfer printer that provides Canadian businesses with a world of possibilities. Whether you want to print large format GHS chemical drum labels, full color digital signs and banners, custom product labels and packaging, or apparel transfer sheets, the UniNet iColor 600 can handle the job with ease. The UniNet iColor 600 includes a white toner kit and RIP software, allowing you to easily swap the black toner cartridge for the white one and then print white graphics and text on clear or dark media. White toner is a standard feature on this laser sheet label printer. While the UniNet iColor sheet label printer can be used for numerous applications, two of its most popular uses are for printing sheet labels and apparel transfer sheets, which are detailed below. With its wide format, tabloid size, you can use the iColor 600 to print large format product labels and barcodes such as pool chemical labels, GHS chemical drum labels, detergent labels, industrial food product labels, or automotive barcodes. 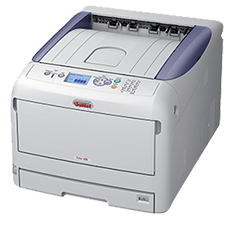 The UniNet iColor 600 accepts a much wider variety of label sheets than traditional laser printers due to its low temperature LED technology. You can use the iColor 600 with pre-die cut sheet labels. If you prefer to digitally cut your own labels, consider using the iColor 600 sheet label printer alongside the Gemini digital die cutter for sheet labels. The Gemini, which is sold separately, allows for precision die cutting of tabloid-sized sheet labels. Another popular use for the UniNet iColor 600 LED laser sheet printer is for printing your own transfer sheets for apparel. For example, many custom t-shirt and apparel businesses use iColor apparel printers to print t-shirt and apparel designs onto transfer sheets. They then use a heat press to gently press the transfer onto the apparel using heat to bond the toner to the fabric. The iColor 600 is particular attractive to this market due to its included white toner kit and optional fluorescent toners. The white toner is commonly used for underlying graphics on dark fabrics or highlights on top. The fluorescent toners allow you to create the most vibrant apparel designs and unique effects when the apparel is worn under black lights. All of the toners used in the iColor 600 are highly durable and able to withstand more than 100 wash cycles. Based in Toronto, Ontario, Canada, DuraFast Label Company caters to businesses that want to bring label and apparel printing in house. 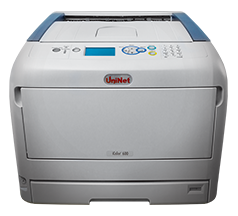 Visit our Toronto showroom or explore our website to learn more about the UniNet iColor 600 sheet printer. If you have any questions or would like to see printed label samples, contact us now.